Ohai anni! Wumbawide-eyedwombats awn ur nawt sekkond! Ai haz seed dat moovie (teh wun maid inna sebenteez, nawt teh remaik wich wuz mush moar goree) an ai dunt blaim kitteh fer nawt wantin tew sleepz! Thx BF! Ai wudn’t eben fink uv seein a moobie wiv a titlol liek dat! ai wuz yung(ish) an mai frendz wantd tew goe…. ai mus sai dat in teh ridjinal, wile teh ick faktor wuz ohai, much uv teh gore wuz implyed ravver dan rite-in-ur-faise. U r rite BF! 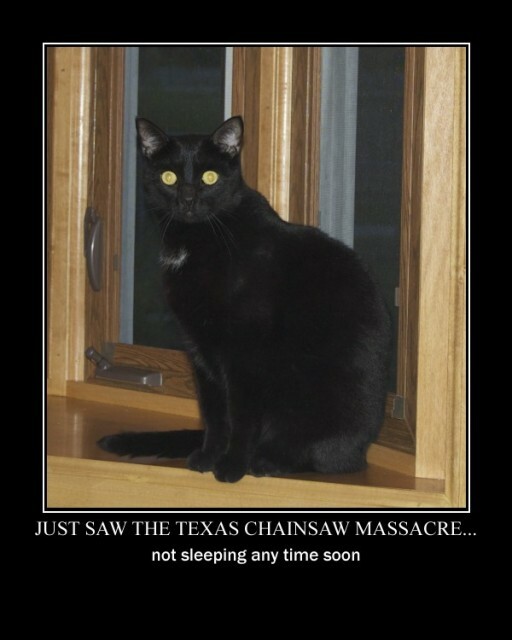 Mai exhubbykat wuz addickted tu da slasher films, so Ai saw moor dan Ai reely wanted tu, but in da old wun da “victims” acktually wawked rite insyde Leatherface’s hoam an der iz a close-up ob him freeking aowt abowt it, wich mayd da “logic” ob da slasher stuff a litlol differint. Plus dey had NO MUNNIES fur da budget n it wuz 120 digrees in dat haowse dey filmed in. Tawk abowt dyin fur ur artz! sometimes that’s worse cuz your imagination takes over! *sigh* Aifink mehbii teh gnu age overt gore haz desensityzd mii. ai iz jes gunna fink itsa character awn Jersey Shore. Jersey Shore the Senior Years? Kant sleep…teh boogity mahn wil git meh! *snerk* Kreepy kitteh problums NCA? Naw. Sully will taik care ob him. Oboi! Mr. Waddurnoose iz gunna bii sew prowd ob us! Elvis is just gorgeous, give him hugs and kisses for me! He reminds me of my black cat I had for 20 years, she was my girl. Plus the little bit of white on the chest my cat had a few white armpit hairs!! Yep iz a gud foto uv a lubblee kitteh! ai agreeifies abowt teh beeutymus ob teh kitteh! awwww! ebreewun iz braiver wif a teddee bay~urr tew gard dem! *nods* Yesh…Chuck Norris haz gawt nuffin awn Pooky. Um…ai mean…spurblol coo flbbt *hic*! watta klever bebbeh ur r! an cayute tew! haowz ur grandah holdin up under teh presshure? Cyottie pattootie bebbeh! Glad u r a cheezpeep tu! PK !! Iz u a a a *wispers* fixer? Not really around, busy writing, but obviously keeping an eye out. I just saw something funny tho. Cory’s either a Pastafarian or needs his own cooking show!!! Weird as it may sound, I use dry spaghetti to play with him sometimes (started with my heart-kitty Loki) – he batbatbats it and it sproings and he looks all satisfied when he shatters it all over and I have to get another one. I left a dozen or so spaghettis in my room on a table – the water bowl is on the floor not far away. Somehow, the spaghettis migrated off the table to the floor, I think when I moved a kitty bed on the same table yesterday, without me noticing. Water gets changed every night and was pasta-free this morning. We just found Cory with a full piece of pasta in the water bowl, where one end was in the water and the other end out, playing with it with singleminded intensity, total absorption, ignoring everything around him (not so common for my lil ADD-boy). Beside the bowl is a piece of spaghetti – one end still straight, the other end in an S-curve like it, oh, got wet and then was removed from bowl and dried. He’s now passed out in one of the many kitty hideyholes, but he took the spaghetti out of the water and left it neatly on the floor beside the bowl before going for his nap-break. Himz Iz an arteest!! Yoo will hab to openz him hiz own shop – purrhapz part ub da Ty Booteek. Calls it Cory’s Kurleeque pasta kreeashuns!! Guud ideer! Ai had spilld sum sgetty awn da flore (o mustaben week ago?) n naow am findin “new” sgetty peeces awl ober da howse. Squeek muss be helpin wif da fall cleening aifinkso. Hard sgetty is so fun tu play wif, it roles awn itz aown n stuff. Den brakes n roles sum moor. Awltho she lubs tu play wif waterz (iyse kubes speshully) she has nawt lerned Cory’s new tallunt! Spose Ai cud “drop” a stikk in da waterz n c wat she duz wif it…. den she cud werk fur Cory in hiz Kurlee-Q Pasta Shawp! Rotini am fun too… is shaped sorta like those plastic spirals and skates reellee well onna floor – and if tehy swallow teh odd lil piece, it wurries me much less tehn teh risk uv swallowing plastic! Also… peenuts still inna shell. Mini-marshmallows am Cory’s favrit (I hazza bideo of him beeting sum up) but O tehy make a mess if yu miss enny afterwards! Fud as kitteh toys, walcome tu mai howsehold. Hii cawk’d hiz hed at it, put hiz paw awp adn timidly bat bat’d it liek hii wuz skared ob it. Musta bin teh afraid’o sauce ai put awn it. Ummm I nawt shur toi pasta Iz sposta be saucie pasta. Mite get abeet messy. Aye am in beeg trubobboble. Pebbles found me in bed with … Zane!! She was horrificated. I pikkid herz up on da udder side ub da bed (iz big bed – king sized). She cuddled for a minute but huffed off wen I reached a skritched. Zane too. Naw she’s pouting ontopa da hamper. Zane, bean a boi, is oblibeebluss to it awl an just snoozin awae!! Itz awl abaowt da gurls isn’t it? Mai Miss Kitty haza hurumph weneber Ai reech fur anuvver kitteh. *sigh* Dun dey no we lubs dem awl? Ai yoosd tu spendin teh nyte wiff papa in hims bed. But nao dat teh siblinz go der (Sofia mostleh, nawt so much Cyrano) ai sleeps in teh gest bedruum, awn teh futon. Nawt lykes kompetishunz. Adn teh gushifudz in der. won ov my kittehs LUBS pasta. Win ai make it, ai awlays has xtrys… fur da kittehs and fur da birdees. Well… Silke (da kitteh who lubs pasta) he goggled awl ob his down and went lukkin fur more. Birdee still munchin on his. Silke jumps up on dat cage and S L O W L Y sneeks over to grap at da peece ov sketti hangin down. Nao ai haz to wach an make shure he doan steel it awl.